New: Video circulating on Internet of destroyed ancient area of Aleppo as of December 2016. A man says , ‘Apology to, sorry for Aleppo”, a woman explains, ‘this was once a UNESCO World Heritage Site’, a man names the stores and a mosque. A Russian and Syrian national flag is in the rubble. Catastrophic damage of the Citadel, ancient souq, centuries-old palaces and houses has been an on-going tragedy during the Syrian revolution. (See here and end of this article.) Beyond human life, there is heritage; it is fragile and teeters on the brink of destruction. Human life and history is being destroyed as I write these few sentences. Beyond the horrific pictures, there is my memory; a minuscule record of beautiful Syria. 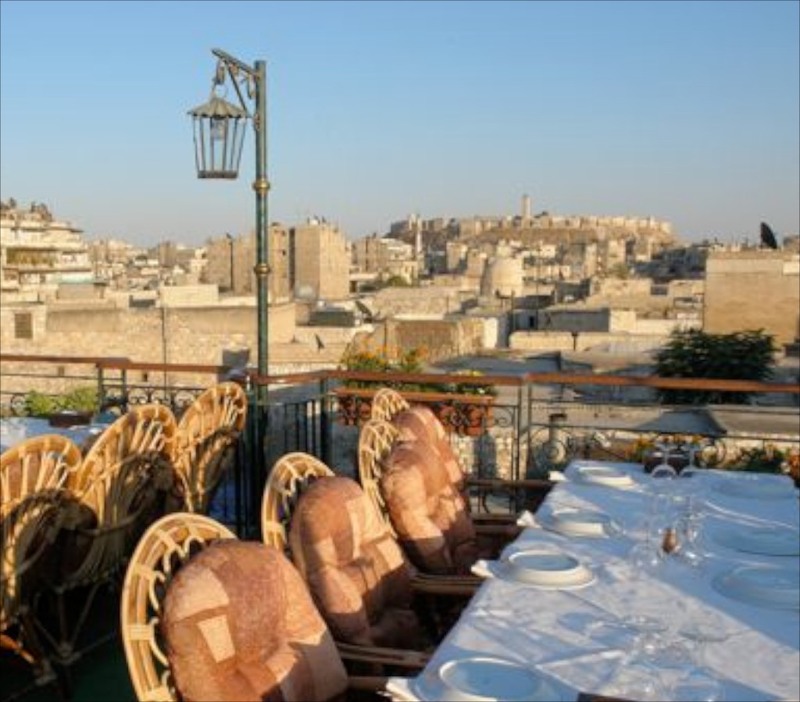 Late afternoon at Dar Zamaria’s roof-top restaurant, looking toward the Citadel of Aleppo, in center of the old city of Aleppo. 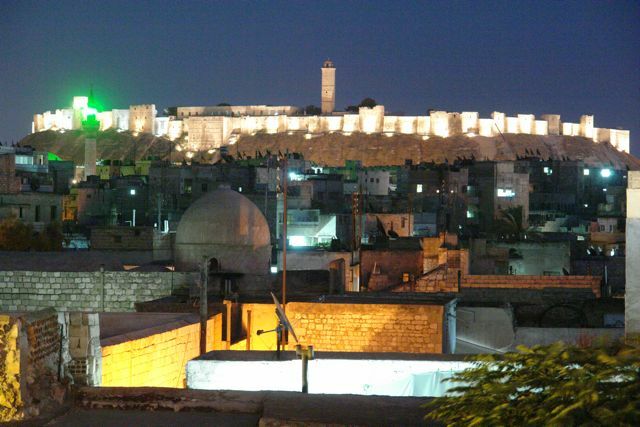 Aleppo Citadel at night dating back to the 3rd millennium BC. Follow this link to pre-revolutionary photo journey of 16th-19th century palace/boutique hotels. – -Excerpts from article written for Egypt Today Magazine, May 2009. Read more about Syria’s history and archaeology at Monuments of Syria A Window of Syria’s Past by Ross Burns. This entry was posted in Syria and tagged destruction of antiquities, Krak des Chevaliers, World Heritage by kobrigama. Bookmark the permalink. Les, So great of you to pay tribute to the historic sites. The damage is heartbreaking. Just returned from Beirut and not only do we mourn the destruction of antiquities but the human tragedies is everywhere to be seen…Syrian men line many streets and squares hoping to find work, refugee families looking for food and shelter. Syria is a tragedy beyond imagination.